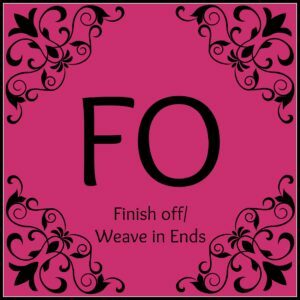 Finish Off is abbreviated “FO” within patterns and is commonly used to let you know that there is nothing more that needs to be done using that color or to indicate that you are finished with the pattern completely. It means that you can now cut your yarn (finish off) and weave in your ends. for finishing off your ends in my opinion. Applying Lesson 3 – Let’s Make Something!